When move-in day rolls around, it’s all the small things that will make a world of difference. We provide extended office hours, high-quality security features, onsite moving dollies, and much more. Because we have storage facilities all around New Jersey, we’re able to serve a wide base of customers. Our properties in Marmora, Mays Landing, Galloway, Egg Harbor Township, and Atlantic City are centrally located within their respective communities, ensuring a convenient drive for our tenants. Do you live in Palermo, Ocean View, Seaville, Hamilton Township, Buena, Somers Point, Longport, Linwood, Northfield, Estell Manor, Ocean City, Margate City, Brigantine, Absecon, Ventnor City, or any of the nearby neighborhoods? We operate a facility close by! With sizes ranging from 25 square feet to 400 square feet, our storage units provide the customized experience you’re looking for. Our climate-controlled spaces provide a consistent temperature and humidity level year round, which reduces moisture build-up and damage to your belongings. If convenience is your top priority, let us tell you more about our drive-up accessible rentals. Whether you need a vehicle parking space or a portable unit, we can accommodate you! One reason we’re a popular choice for local residents and businesses is the fact that we boast such low prices. 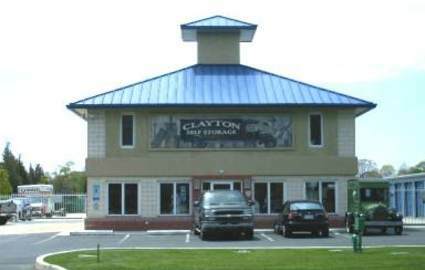 While other companies make you choose between affordability and premium amenities, Clayton’s Self Storage delivers both at once! Some of our properties provide services like onsite shipping, moving truck rental, packing supplies, and loading ramps.